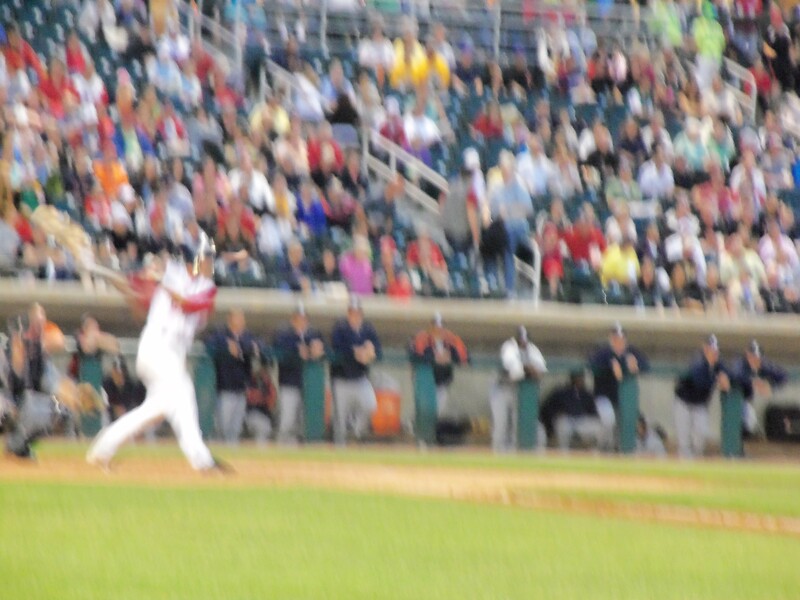 Last night, June 17th, was the Lowell Spinners opening day. The first day that new draft picks and guys from the Gulf Coast League all come together and put on a new uniform. The first day that professional baseball comes back to Lowell. The first day of normalcy. I’ve had my tickets since the Thread Sox Nation presale started, and had the same exact seats I had last year for Opening Day: front row first baseline. It might be the best view in the place, which is saying a lot. There is literally no bad seat in the stadium. As soon as I walked in, I assumed the position near the first base dugout and immediately noticed Garin Cecchini, the Red Sox 4th round pick in 2010, already on the field. It was a bit unusual, as normally the players start to roam out of the dugout half our before first pitch. My first impression of Cecchini? Might be the nicest guy in the Red Sox organization. He looked so happy to be in Lowell, so happy to be playing a kids game, and just so happy in general. He talked to a bunch of the fans, not coming off as doing the fans a favor, but like he actually wanted to be here. It was very, very refreshing. The Spinners sent out a rehabbing Mike Lee to start their season. I had never seen Lee in person before, and I was excited to finally see him. You could tell he didn’t have his “A” stuff, but he kept himself composed and never looked nervous. He was a little wild, but that’s to be expected with rust. He did, however strikeout his last two batters before getting pulled in the third inning due to his extremely high pitch count. In his 2.2 innings, Lee also walked 3, let up 2 hits and plunked a batter. Returning to the Spinners this year was Seth Schwindenhammer, who I spoke briefly about in my last entry. Aside from his number and phenomenal surname, I could not tell that it was the same batter. It seemed like the game slowed down for him. He hit with a confidence I didn’t see last year, and it payed off when he launched a second inning solo home run, tying his season total from last year. Garin Cecchini also made an impressive professional debut. After getting hurt during his senior season of High School, and not playing last year, he certainly impressed, going 2-4 with a rifle of a double down the right field line. He stole a base in the first inning, in a play that wasn’t even close. He was certainly swinging a High A bat, but his defense was shaky. Cecchini had a throwing error in the fourth, on a play where he struggled getting the ball out and then throwing well out of the reach of first baseman Boss Moanaroa. Error and all, I still walked away very impressed with the ability and talent from Cecchini. I don’t know when I’ll be back in Lowell again, but I know it’s going to be soon. I like the team a lot this year, and hope to do some stuff that I didn’t have the chance to do last year. Yeah, yeah, I know. How can you preview a team that doesn’t even have half it’s roster yet? The answer is simple! It is my first of many! Last year, the Spinners couldn’t get a lot going. The pitching wasn’t there, the offense had trouble adapting to wooden bats, it was a struggle for the good guys all season. As I’ve written before, they did have some really good things happen, such as the break out of Felix Sanchez, Miguel Celestino and Hunter Cervenka. Madison Younginer looked better and better as the season progressed, and Kolbrin Vitek earned himself a promotion to Greenville halfway through the year. All of those players are gone. The crop that does project (at the moment) to be in Lowell, though, looks to be fun to watch. Garin Cecchini and Xander Bogaerts are two of the highest rated infielders in the organization, with ESPN’s Keith Law having Bogaerts in his organization Top 10. Bogaerts will be 18 on Opening Day (June 17th), and already has a professional season under his belt with the Dominican Summer League team. Last year with the DSL Red Sox, he hit .314 with 3 homers, 5 triples and 42 runs batted in. He was only 17 years old last year. He has experience with the wooden bat, and should come in to Lowell ready to impress at the shortstop position. Cecchini, a 4th round draft pick out of Lake Charles, Louisiana, is slated to be the Spinners third baseman. Cecchini waited until August 16th last year to sign, and ended up not playing for any affiliate last season. However, at Barb High School, Garin hit .545 as a senior, but did miss significant time due to an ACL injury. Before the injury, Cecchini was projected as a first round pick. Most likely returning to the Spinners is fan favorite Seth Schwindenhammer. Last season for Lowell, Schwindenhammer found himself competing for playing time in a pretty packed outfield (Felix Sanchez, Bryce Brentz and Brandon Jacobs manned the starting positions), but as of now looks to be in Lowell’s Opening Day line up. However, when he did find playing time, he struggled a bit at the plate, hitting .192 in 33 games. There is a lot of power potential in his swing, but he has yet to translate that into games. Schwindenhammer was one of the last names in the 2010 Minors Moniker Madness, a contest in which fans got to vote for the best name in Minor League Baseball. Every fan has a favorite player, and last year was no secret that Felix Sanchez was mine. With him going to Greenville, though, I’ve had to find another: Swen Huijer, I’ve talked to him a couple times, and he is just an insanely nice guy. Last year he pitched for the Gulf Coast League team for the third time, and put up solid numbers. The 6 foot 9 inch Huijer compiled a 5-2 record last season, and showed good command, only walking 10 hitters in 33.1 innings. Huijer doesn’t have the overpowering stuff you would expect out of someone his height, but tops out at 89 MPH on his fastball, but needs to work on his curveball and change up to have success in the next level. Tyler Wilson is going to be the last prospect I talk about. He was also in Lowell last season, and had moderate success for the team. 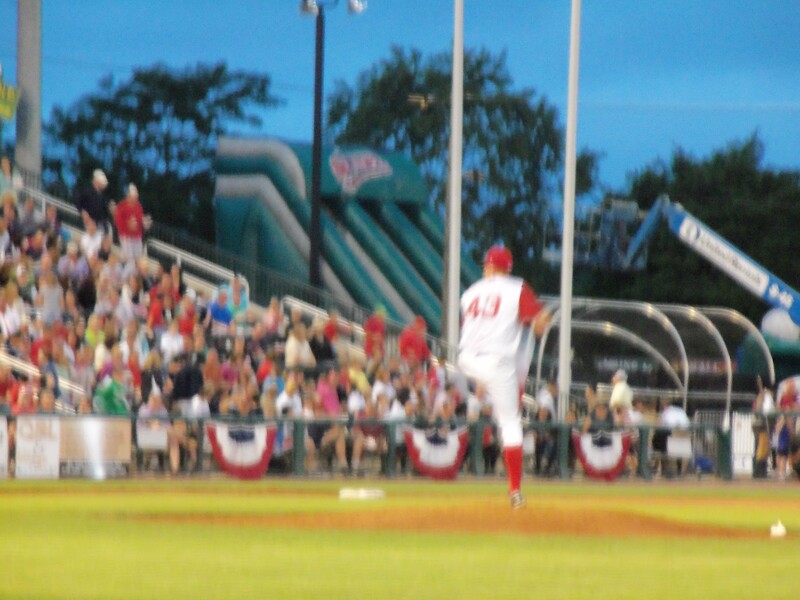 In 14 starts, Wilson led the Lowell staff in innings pitched (64.1), was second on the team in wins (3, tied with Madison Younginer) and 5th on the team in strikeouts, with 41. Wilson has a heavy fastball, and a good start to his season could result in a call up to Greenville. Granted, this is all in the air right now. It’s not certain that any of these players will come to Lowell, or even stay in the Red Sox system. The MLB Draft hasn’t happened yet, either, and that’s where a big bulk of the 2011 team will come. One thing is for certain, though. I can not wait for Lowell Spinners baseball. At 3:41 AM, Eric Ortiz (whom I have never heard of) posted an article about how the 2011 Red Sox are going to contend with the 1927 Yankees as the best team ever. Look, I like the Red Sox more than anyone I have ever met. I loved the offseason additions we’ve made, and I think we are in an extraordinary position to contend in 2011. There is no way we will contend with that level of greatness. Are you telling me that David Ortiz is our Babe Ruth? That Adrian Gonzalez is going to be our Lou Gherig? No. That’s absurd. We are a good offensive team. We have good starting pitching. You know when else I said this? The same time last year. I thought for sure we were going to dominate all competition. Then Josh Beckett got hurt. Dustin Pedroia and Jacoby Ellsbury same thing. Kevin Youkilis got hurt. So did Victor Martinez. John Lackey failed to live up to expectations, as did JD Drew. There are so many things that can affect a season. I know we’ve added Bobby Jenks and Dan Wheeler, but we’ve also added Matt Albers and are bringing back Hideki Okajima. That’s not a good bullpen, and I don’t think us potentially bringing Brian Fuentes is going to be much help. Jon Papelbon has to prove to us he can be an elite closer again before we can even say we’re the best team in the division, nevermind all of MLB. I’m ecstatic to see what 2011 brings. But lets play a game before people call us the best team in Major League Baseball history. How cool would it to have Carl Crawford in Boston? Guy steals everything. Art, music, bases, doesn’t matter. It was fun watching him in Tampa, even if it meant his thievery on the basepaths usually hurt Boston, but the guy is a straight exciting player. I know a lot of Red Sox fans want Jayson Werth, for good reason. I just think Crawford would be a better fit in Fenway Park. He has elite plus plus speed, a good glove plus a good arm. Imagine him and Jacoby Ellsbury roaming the outfield? Nothing hit to left-center is falling. His offense has always been there. He’s coming off a year in where he had career highs in homeruns (19) and RBI (90). Inside Fenway Park, with the Red Sox lineup, those numbers are only going to escalate. We have the triangle, and with his speed he can run for days. He’s going to steal you 35+ bases a season. In his 9 year career, he’s stolen less than 46 bases twice (once in 2002, where he only played 63 games). I really hope Boston can land him. Everything about Crawford is a weapon. He has a great bat, unbelievable speed and good defense. Yo, Carl, if you come here I’ll buy you dinner. Now that the 2010 Lowell Spinners season is over, we can safely reflect on the ups and downs of the season. I went to a bunch of games, and followed online to the ones I could not go to. It was a tremendously fun season to be apart of, and basically this is me adding on to it. Now, the Spinners were not a very good team. They had a lot of guys hit under .225, and their pitching really wasn’t the greatest thing in the world. However, I picked up on a lot throughout the year. Bryce Brentz has everything right now..except a solid plate approach. Madison Younginer had games where he would absolutely dominate, and others where he couldn’t string together solid innings. It’s so common in the minor leagues, that I know enough than to say bust. The surprising player this year might have to be Felix Sanchez. He was 7th in NYPL in hitting, boasting a .325 average throughout his season. The Spinners leadoff man is not a power threat, though. Hitting just 6 doubles, most of hits hits were slap stick singles (ala Johnny Damon) or infield hits. Sanchez has unbelievable speed, though. The dude simply flies. Like I have talked about entry-after-entry, I got to know Felix this year. That’s not why I’m so high on him..he really is an explosive player. He covers amazing amounts of ground out in center field, and there is no one better on the base paths. Seriously..Felix had 38 steals for Lowell, more than anyone else in a season to ever put on the uniform. However, it’s in no way a landslide for Felix. Third baseman/DH Kolbrin Vitek got a late season promotion to Greenville, but in his time here, he raked. 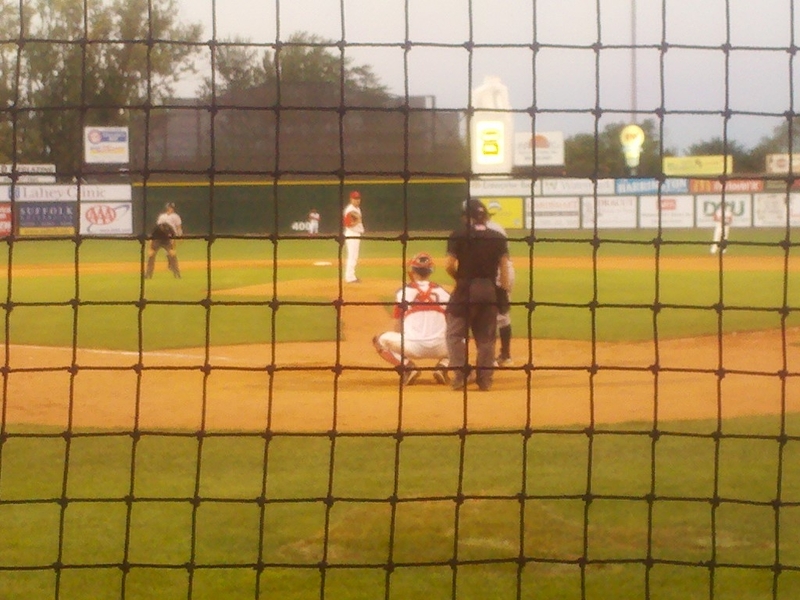 Vitek hit .270 for Lowell, but hit 4 homers and drove in 30 RBI in his time. He had some clutch at bats for the Spinners, including a very lengthy at bat in Fenway Park where he fouled about 5 pitches off to earn a walk. Brandon Jacobs was the teams best power hitter, almost undeniably. I saw him connect on an absolute bomb to left field. Jacobs hit .242 with 6 homers, 2 triples and 18 doubles. The words 5-tool prospect comes to mind when you think of Brandon..he was also a running back recruit to Auburn University. These 3 guys all had fantastic seasons. This was Vitek’s first professional season, and he adapted extraordinarily well. It’s going to be fun watching him in the bigs..but for my money, no one was more valuable than Felix Sanchez. Minor League Baseball is a wonderful thing. How the team does on the scoreboard does not matter, it’s all about player development. How certain players handle certain things, certain situations. It’s the first time a lot of players play in front of decent sized crowds, where the Gulf Coast League and Dominican Summer League don’t play in stadiums, but at high school-level fields. 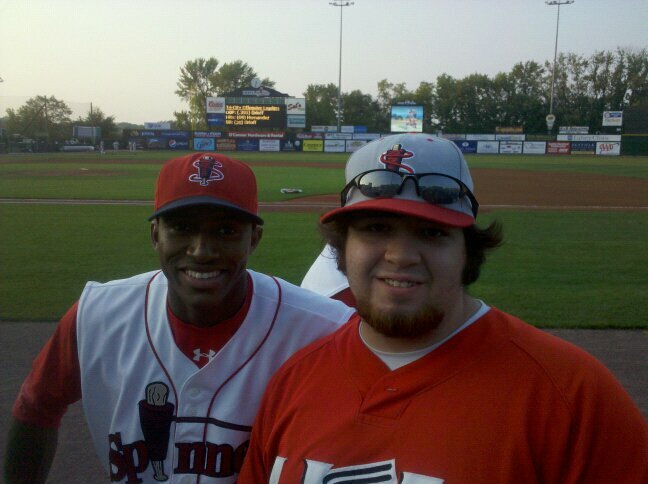 This year, like I’ve stated, I added a couple of the Lowell Spinners on facebook. I didn’t really talk to many, but I would say ‘good game’ or ask a question about something that happened. They were all really cool about it. I know I’ve talked about this before, but at the home finale, something really cool, and really unexpected happened. When I go to the Spinners games, I walk in and walk down to the first base dugout. I’m usually second there, next to an autograph collector who is a pretty nice guy. I never got his name. When the team comes out, I try to have them sign my team ball, but where as my ball is now full of signatures, I just really wanted to say hey. Felix Sanchez, the teams All-Star centerfielder, came out of the clubhouse and I yelled hey to him. He looked over at me, gave me the “one second!” finger, and disappeared. About two minutes later, he came back out with a bat and walked over to hand it to me. Now, I talked to Felix more than any other player. He actually talked to me before I talked to him, something I thought was pretty cool. We talked a couple times a week throughout the season, and I was actually the one to inform him he was the one to make the All Star Team. That was pretty cool. I never asked him for anything. I didn’t ask him to throw me a ball, or give me some equipment. When he handed me that bat, I was ecstatic. Even better, was he signed it. 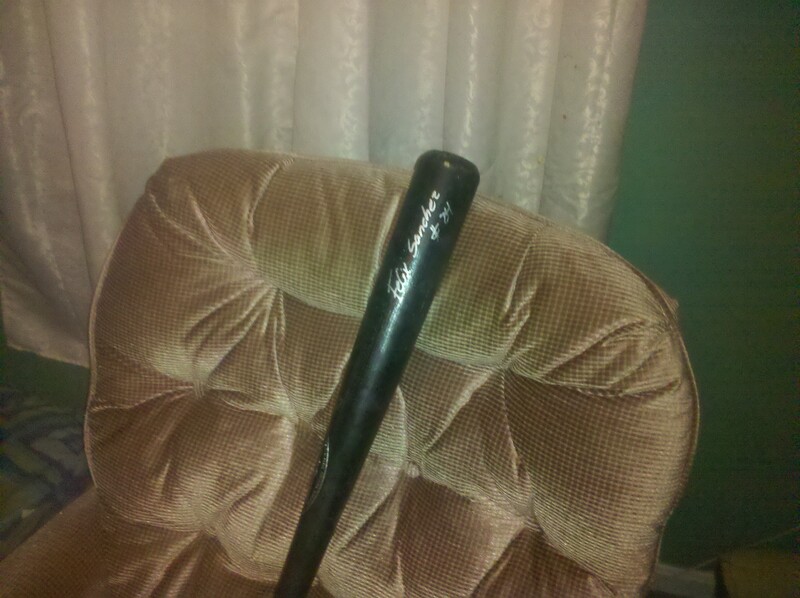 One of the most valuable prospects the Spinners have, singled me out and handed me a signed, game used bat. It was probably the coolest thing that has ever happened to me in the stands. (I would later drop a foul ball hit directly to me). Really, I just wanted to take the time out to thank Felix on a great season, where he went above the game of baseball and made a fan feel awesome. I never had this much fun during a baseball season, and it was something very, very special to me. Before this season, I never got in to autographs. If I got one, cool, but I never pursued players in order to get them to sign something. I never waited by the dugout before a game, hoping that a player would come over and sign for me. This season, though, I felt closer to the game than I ever have. Like I said in my last entry, I did a Fantasy Camp for the Lowell Spinners, where players coached me. I talked to players on a one-on-one level. I felt like I needed to save a little bit of the season, so I could have more than just memories. The Spinners have been great to me this year. I’ve talked about the Camp, the tour, and how the players have talked to me a little. I really love the Red Sox organization, and everyone involved with the Spinners. They have shown an amazing amount of class, on all fronts this year. It started off with just Jay Broughton, who I talked to in the outfield of Fantasy Camp. I got to know him a little bit, so it was cool to have him sign my ball, for proof. Then, I wanted Felix Sanchez to sign, because of how much I liked him as a player. David Renfroe is suppose to be a good third baseman at the Major League level, so I had him sign the ball. I figured that I would be done after that. I still wasn’t completely in the autograph scene. One game, though, I arrived when gates opened and hung out near the dugout. Jayson Hernandez came down to sign, and he was also one of the Fantasy Camp coaches. He remembered me, so it was cool to have him add his name. Mike Hacker, who I saw get a save the night before, came over and signed my ball without me asking. I was excited. James Kang also came over and signed. I started thinking..this is pretty cool. I get to talk to the players, tell them how cool it is to have them play right in front of me. How I can tell them I saw Kevin Youkilis and Jacoby Ellsbury play on this same field, and now they are great Major Leaguers. How I know that one day they will be there. The last game I went to, I wanted to get a couple more. Bryce Brentz was my favorite player going into the season, and I really wanted him to add his name to my ball. While he didn’t sign, a ton of players who I knew without looking them up, came over and signed. The Spinners power-hitting left fielder, Brandon Jacobs, was the first to sign. JT Garcia also came over, and then the Jose Garcia (NYPL All Star) also signed. I would of been content with just those three, but I kept my position. I wanted to see how lucky I could get. I got bolder. I yelled for Stephen Fox (politely), to come over. He did, and signed. 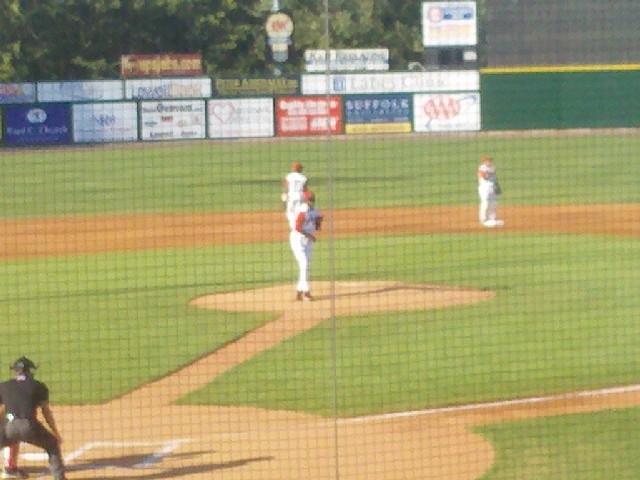 Stephen Fox is my favorite bullpen arm the Spinners have. After the starting 9 warmed up, Miles Head came over to sign for the little boy next to me. He made his way down the line, and added his signature. Miles Head is a really cool dude, and he was really personable. He doubled this game, and I felt my ball mean more to me than it did before. Tyler Levigne started walking back from the bullpen, and I told him I appreciated his participation at Fantasy Camp. He walked over and signed for me. I had 3 of my 4 coaches from Fantasy Camp sign for me..I just needed one more. The only downfall is I hadn’t seen him. After Levigne signed, Cesare Angeloni asked if I wanted him to sign. Honestly, I thought he was Levigne. They had the same face, the same sunglasses and were about the same height. He took it before I answered, and added his name. I was kind of happy to see it WASN’T Levigne, because I wanted as many individual players as possible. That was all the pre-game signatures I got..and I was stunned. I was very happy, because a couple of my favorite players (J. Garcia, Head, Jacobs and Levigne) all came over and signed. I was perfectly content with being done for the day. I went back to my seat and watched the game. After about the seventh inning, my section (behind home plate) started emptying out. I moved a little closer, and noticed some scouts with Stalker guns. At least, I thought they were scouts. Two looked really familiar. One was Madison Younginer. I had seen Younginer pitch at Fenway Park, during the Futures at Fenway, and again on my birthday. He is one of the top rated pitching prospects the Spinners have (I don’t include Ranaudo, Workman and Hernandez because they aren’t expected to play), so I told myself I would approach him after the inning, when he didn’t have to chart. He handled it really well. I asked if he didn’t mind signing for me, and that I really appreciated him doing so. He was really cool about it. I didn’t want to bug him, so I said thank you and went away. Above him, I noticed Hunter Cervenka: my final Fantasy Camp coach. He was sitting next to Keith Couch, who I saw at the home opener pitch 5 brilliant innings. They were both very nice about signing, and I told Cervenka that I appreciated his help at the Camp. I really can’t stress how much I do appreciate those guys helping out. Without them, we still could have done the Camp. It wouldn’t nearly as been as much fun, and I am very happy I got that experience. That was my day. 10 signatures, including my favorite guys on this years team. Maybe my reasoning for autographs is different than most. I don’t want them to say I have them. I don’t want them to sell, give away, or anything like that. I feel it brings me closer to the game, that I am more apart of it.